Listing inventory is riding low as it usually does this time of year. If it seems lower this year, you may be right. I spoke with a Realtor this week who usually carries 30 listings and they’re down to 6. As you can see by the graph, official numbers from Florida Realtors bear this out. We’re still waiting for the June numbers to come out. 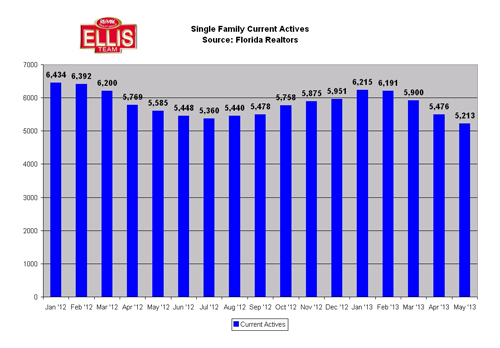 May’s numbers showed a decrease from 2012 inventory levels by 372 homes. Last year inventory levels reached their lows in July but we’ve already surpassed those numbers with May numbers, so we’ll be watching June and July numbers when they come out. Ellis Team at RE/MAX buyer specialists were busy this past weekend, and showings seem to have picked up a dramatically in the past week too. Showings on our listings increased. I checked with our listing coordinator and he said this past week was very busy and the week before wasn’t. Of course, the week before was July 4th week so people tend to concentrate on outdoors and fun that week anyway. Several of our listings have been receiving previews and showing for some of the Hertz relocation employees. A few weeks ago I was quoted in a News Press article and while the article never said who had the Hertz account people inferred that the Ellis Team did so we’ve been flooded with people calling and emailing asking us to show their rental or home to Hertz employees. We don’t have the Hertz account. I had people argue with me and tell me we did because they thought they read it in paper. These people weren’t looking to list their rental or home for sale, they just want employees to know about it. The fact is, no matter who has the Hertz account those employees will know about it if the property is listed. I assure you many of our listings have had interest from Hertz agents. Every year I go on listing appointments and some sellers will say we’d like to sell to the Germans, or the Canadians or whoever else they perceive are buying this year. It’s almost as if they want top dollar and they think the Germans will overpay for US homes because they don’t know better. I assure you, nobody likes to overpay for a home no matter where they come from. We work with many International customers and they all do their homework. Hertz employees are no different. And really, does it matter where the buyer is from or who they work for when they’re buying your house? Money is money and most sellers we meet with want top dollar. There’s nothing wrong with that. We believe everyone should receive what the market is willing to pay. When we list your home your home is exposed to buyers locally and internationally. We use traditional print marketing as well as advanced online techniques that gets your home noticed. Your buyer could be from Hertz or Intel, from Florida or Switzerland. With inventory levels at lows this year it may be a good time to start thinking about selling. Interest rates are rising, so if you’ll be getting a mortgage on your next home it could really cost you to wait. See our last few articles at Blog.TopAgent.com to read about how rising rates are costing home buyers. Good luck, and Happy Selling/Buying!!!!! Posted in Cape Coral, Cape Coral Real Estate, Fort Myers, Fort Myers Real Estate, Southwest Florida Real Estate.Tagged 33907, 7910 Summerlin Lakes Dr, Cape Coral real estate, Ellis Team at RE/MAX, Fort Myers Florida Real estate, Hertz relocation, Riding Low.